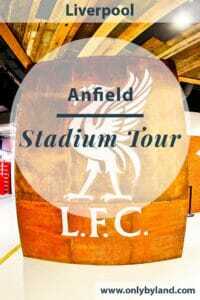 The Liverpool stadium tour is given by 2 tour guides. All guides are knowledgeable Liverpool fans so should be able to answer any of your questions. Anfield is located close to Stanley Park in the suburbs of Liverpool. It’s easy to reach by local bus from the city center. A more majestic way to reach the stadium would be by the Anfield bus which leaves from Albert Dock. The Anfield bus is a traditional English double decker bus. I stayed at the Staybridge Suites which are located next to the Albert Dock so it was easy for me to catch the Anfield bus. As you take the escalators to the top of the main stand you’ll pass Liverpool memorabilia. The ‘Joey at the frogs legs’ banner was used in 1977 European cup final. 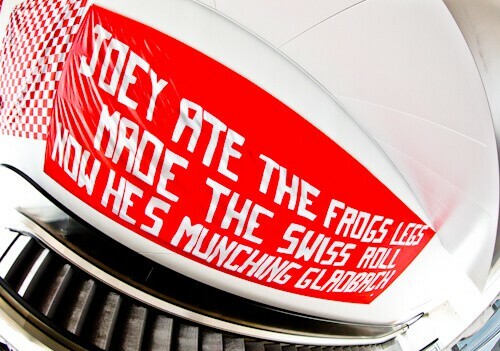 ‘Joey ate the frogs legs’ signifies beating Saint-Etienne of France in the quarter final. ‘Made the Swiss roll’ signifies beating FC Zurich of Switzerland in the semi-final. ‘Now he’s munching gladbach’ signifies them playing Borussia Mönchengladbach in the final. Joey refers to Joey Jones who was a player in 1977. The banner was used in the 1977 champions league final which Liverpool won. The first stop on the Anfield tour is the top tier of the Main Stand. From the top tier you not only get an amazing perspective of the stadium but you also get a city view. 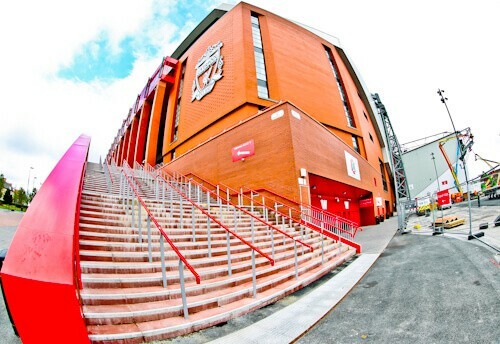 Anfield is built in one of the highest areas of Liverpool. To the right you can see the city skyline and many of the cities famous landmarks. Liverpool has 2 cathedrals which are both visible from the stand. Did you know the largest cathedral in Britain is located in Liverpool. You’ll see it from the main stand. The most famous stand in the stadium is The Kop (above right). Directly opposite the main stand is the Kenny Dalglish Stand. There are 2 football teams located in Liverpool. The other team is Everton who play in Goodison Park. 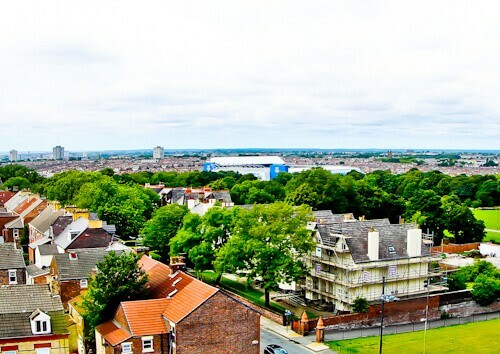 From Anfield you can see Goodison Park at the other end of Stanley Park. It’s possible to take stadium tours here during the football season too. The guide gave some interesting facts about the Everton rivalry. Apparently the rivalry is a friendly one. An interesting fact is that from 1892 to 1896 Liverpool was the team wearing blue and white. When the new stand was built it was decided to keep a memorial to the old stand inside. A few of the wooden seats and bollards have been reconstructed inside. If you went to watch a match in the old Anfield the cheapest ticket would have been a seat with a bollard obstructing the view. You are free to take pictures in this piece of the old stadium. 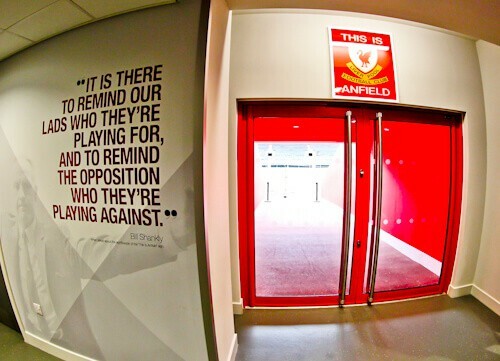 The home dressing room were designed by Jurgen Klopp. He has organised it so the players sit in order according to their shirt number. This to stop there being groups of French speakers or Spanish speakers in the changing rooms. The language spoken in the Liverpool changing room must be English. The idea being that Liverpool are one big team as oppose to groups of smaller teams. In contrast to the home dressing rooms are the away dressing rooms. These are basic and the temperature not controlled. In the away changing rooms it’s either too hot or too cold. Does this give Liverpool a home advantage? I believe it does! Bill Shankly is arguably the best manager in football history. To this day he is the only manager to win the Champions League 3 times with the same team. He designed the famous ‘This is Anfield’ sign. You see it as you enter the players tunnel. In Bill Shankly’s words ‘it is there to remind our lads who they’re playing for, and to remind the opposition who they’re playing against’. On the stadium tour you can get your picture with the famous sign. You can also touch the sign as the Liverpool players do when they enter the tunnel. Outside the stadium is the Hillsborough memorial. This memorial is here to respect the 96 who lost their lives as a result of the Hillsborough disaster of 1989. Part of the monument is an eternal flame. Whilst the stadium was being redeveloped the eternal flame remained alight in Liverpool Cathedral. The pedestrian walkway outside the stadium where the memorial is located is respectfully named Avenue 96. You will find monuments, plaques, benches and gardens in memory of the many Liverpool greats over the years. 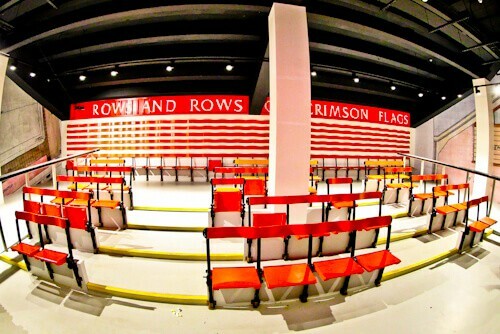 The Anfield stadium tour will take you about 90 minutes and you’ll be accompanied by 2 guides the whole time. 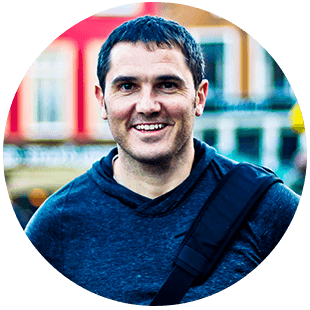 Make sure you ask the guides all the questions you have. They are really keen to talk about their team as well as their city. As for your photos of the stadium and selfies, ask the guide for tips. You’ll have the opportunity to buy a souvenir photo with the European cup at the end of your tour. I took a standard Stadium Tour but it’s also possible to take legend tours and match day tours. Legend tours are given by legendary Liverpool players such as John Aldridge. Enjoy your stadium tour of Anfield, home to Liverpool FC. If you are staying in Liverpool I recommend the Staybridge Suites. It’s located next to the Albert Dock. The classic English red double decker Anfield bus leaves from very close to the hotel. Out of all sports soccer is one of my favorites. It brings back memories of watching with my dad. He would have loved to go on this tour. I will have to share this with one of my friends who loves visiting all the different Stadiums across the world I think her family would love this. That must have been truly impressive visiting such a stadium that rich in tradition. Even people who have not really anything to do with soccer know this mighty name – FC Liverpool. And I agree, its truly a legendary club and the stadium as well. I can also remember the tragic disaster in 1989, I saw these pictures on TV – that was truly a shock to see all the masses panicking. I love the idea of Jürgen Klopp in the dressing room, that’s brilliant and I assume great for pushing the team spirit as well. Interesting insights, James, thank you! I don’t know a whole ton about football but I do know that Liverpool fans are some of the most dedicated and passionate football fans out there. This sounds like a very in-depth tour, and I can see how this would be a great experience for footie and sports fans who are visiting. I also had no idea that the largest cathedral in Britain is located in Liverpool! A friend of mine would absolutely love an Anfield tour. He lives and breathes Liverpool. I could never quite understand why people get so passionate about their football team. But reading your post has given me a bit of an insight. 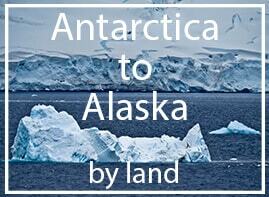 Sounds like a very interesting tour! I am not a big football fan, but I totally would visit Anfield to do a tour. Great to know that it is one of the oldest stadiums. 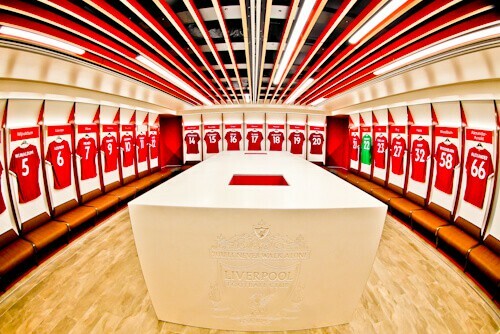 I think the design of the dressing room is very smart – good to mix the players up a little bit! Add some diversity to the mix. Great write up on my favourite team! I’ve never been to Anfield but what they are doing with the stadium is impressive. I read they were going to increase the capacity again to 60,000! You’ll have to do the tour again! I am a huge Liverpool fan and hope to make it to the stadium one day. As i’ll travel from far away I’d have to go for the match day tour. First a tour of the stadium and then watch a match. The new stand and changing rooms look impressive! I’m not a huge football fan but I know my boyfriend would have been SO excited to see this. I’m sure it was incredible as a Liverpool fan, especially! My favorite football experience was going to a game at Rio’s famed Maracanã…like this, it was awesome to see such a famous, iconic spot in person! I would love to visit Liverpool because of the Beatles! Although I’m not a big sports fan, I think it would still be fun to take a tour of the stadium. I love that sign and the reason behind it. So inspiring. Such a lovely stadium. The field and the dressing for the home team is really beautiful. Seriously, the away teams have always been treated badly. I can imagine why the home team has to win always. They’ve been treated as royals so they ought to live up to that. I am a huge sports fan and I always get butterflies when watching games live. I could imagine for anyone who is a big fan of the Liverpool FC to want to visit their stadium. But when traveling here, I think it is one of the must-do’s since it’s such a huge part of Liverpool’s identity! My brother and stepdad are diehard United fans, so I’d go so far as to say I’d be cast out of the family if I were to go on an Anfield tour! The cheapest tickets being the ones with bollards in front of you – isn’t that still how it is with Sports now? Haha. I got dirt cheap tickets to a rugby match in the Millennium Stadium years ago and I couldn’t see a thing. “Football is a simple game. Twenty-two men chase a ball for 90 minutes and at the end, the Germans always win.” – well, seems thats not always the case, huh? I’m not that much of a football fan, but if i were to visit GB with one of my pals… He’d drag me for sure to this place 😀 . My husband would love to do a stadium tour like this one! He has never been to Liverpool but he knows about Anfield and the huge club history. In fact he has seen Liverpool play here in Europe. It would be a completely different experience to see them play in their own stadium. the fish eye lens works so well with the photos here! I would not have thought it was so stadium friendly! 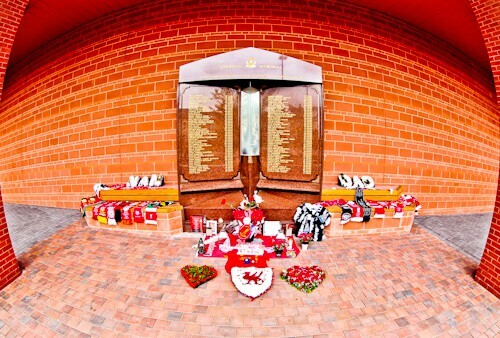 The hillsborough memorial is very moving – so much history in one football ground. I am not very much sports kind of person but always love to see stadium. 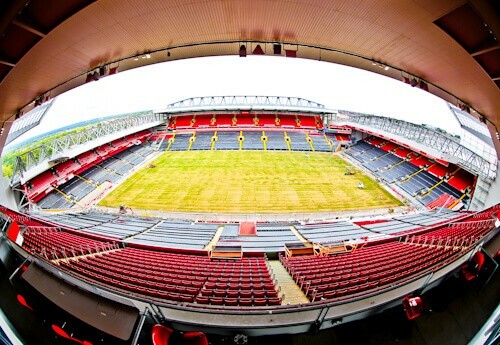 This Liverpool soccer stadium is beautiful and also a must visit thing as it is one of the oldest stadium. View of 2 cathedrals from its stand must be interesting. I liked the hometeam dressing room with bright red colors. The Anfield stadium tour must be nothing short of a pilgrimage for football fans. The stadium looks really impressive. I am particularly fascinated by the player’s tunnel and the iconic sign. I am sure getting photographed here is a moment of reckoning for fans. Nice write up on the tour. Love these tours for the facts like Liverpool wearing the blue and white in the late 19th century. Who would have known! I plan on doing a big London trip later in 2018, would be cool to do all the stadium tours in one weekend. Though that could be a bit overwhelming with the infomrtaion. Enjoy your trip to London Jub!